A report by the International Institute for Sustainable Development (IISD), an environmental non-government organization, estimates that pollution in Canada is costing the average Canadian family $5,700 (Cdn.) per year. The report claims that negative impacts on health, forests, crops, land, and water quality can be quantified in terms of monetary loss. 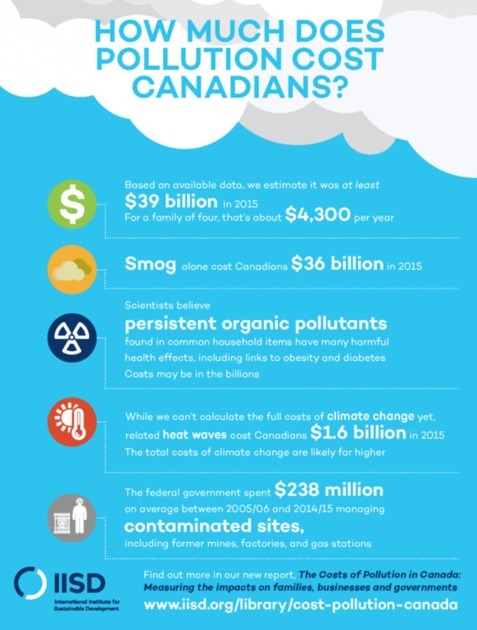 The report, entitled “Costs of Pollution in Canada: Measuring the impacts on families, businesses, and governments”, found that pollution costs in 2015 in Canada totaled $52 billion (Cdn.). The IISD estimated that smog was the biggest contributor to lost income and increased expenses to Canadians, contributing 92 percent of the total cost. The report also investigated the costs of persistent organic pollutants (POPs) and their negative impacts on health; heatwaves; and management of contaminated sites, including former mines, factories and gas stations. With respect to contaminated sites specifically, the report authors examined publically available information on the number of contaminated sites there are in Canada under federal jurisdiction and the costs of monitoring and cleaning up the sites. They found that between fiscal year 2005 and 2015, that the average annual federal expenditure on managing contaminated sites under federal government control to be $283 million. The authors note that this cost represents a lower bound on the total cost of managing contaminated sites in Canada as it does not include sites under provincial, municipal, or private ownership and control. The report also examined the future costs of managing contaminated sites by federal and provincial/territorial governments. In 2015, the report stated that the total future liability for contaminated site clean-up recognized by the federal government was $5.8 billion. In addition, $6.4 billion in environmental liabilities were recognized by provincial governments. The publication synthesized existing studies and explained that more research is needed to fill data gaps regarding costs related to: greenhouse gas (GHG) emissions in terms of climate change and its impacts on the economy and the environment; heavy metals in terms of human health; and fertilizers and other nutrient runoff in terms of excessive growth of aquatic plants and algae.